Here at Westfield Animal Clinic, we have knowledgeable staff to ensure the utmost level of care for your pet. We pride ourselves on promoting health and wellness through preventative care and building long-term relationships with our clients and patients. Below, is a list of our staff and some information about them so you can learn more about the people who are here to serve you and your pet. 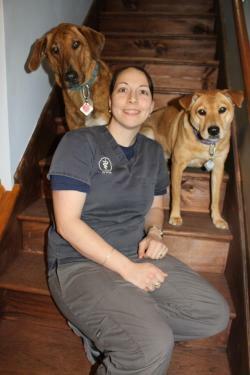 Dr. Denise Larochelle has owned Westfield Animal Clinic with her husband John since November 2013. Dr. Larochelle has been working in the veterinary field since 2002 beginning as a veterinary technician before completing her doctorate of veterinary medicine degree from Iowa State University in 2010. Following graduation, she completed a 1 year rotating internship at New England Animal Medical Center in West Bridgewater, MA. Dr. Larochelle first began working at Westfield Animal Clinic in 2011 prior to purchasing the clinic in 2013. Dr. Larochelle grew up in Southwick, MA and now resides in Westfield, MA with John and their 2 dogs Belle, a mixed breed, and Wilbur, a plot hound/collie mix. They also have 2 cats Lyla and Lynyrd. On November 5, 2015, Dr. Larochelle and her husband John welcomed their first child, Emilie and recently on October 4, 2018 welcomed their second child, Abigail. Dr. Larochelle’s special interests in veterinary medicine include surgery and preventative care. Dr. Larochelle is a member of the American Veterinary Medical Association. Most recently, on December 21, 2018, Dr. Larochelle was selected for inclusion in the forthcoming Trademark Women of Distinction Honors Edition for demonstrating dedication, leadership, and professional excellence. Her compassion and expertise set the standard in the industry. She has truly dedicated herself to her profession. Representing humility and personal touch she adds to her relationship with everyone she does business with, more than the value of her service it's her way of treating everyone like an extended member of her own family that people remember the most. As a talented disciplined professional she has maintained a proven track record of quality service, driven by her desire to succeed. During the vetting process it was noted along with her exceptional reputation that she has also maintained a positive peer rating. Her years of service along with her level of expertise and several other factors also contributed to her inclusion. She prides herself on honesty and integrity. She is the kind of professional admired by colleagues and peers alike. Her kindness and willingness to always help others and find solutions to most questions is both exemplary and honorable. She has made her mark on her profession as an expert and will become part of history as one of the top professionals in her field. When not practicing medicine or working around the clinic, she enjoys spending time outdoors hiking, sight-seeing, and spending time with family and friends. Dr. Amanda Lajzer joined the staff here at Westfield Animal Clinic on July 1st, 2017. Dr. Lajzer has been a veterinarian since 2015. She received her undergraduate degree from Umass Amherst and her veterinary degree from St. George's University and Ohio State University. Dr. Lajzer is a native of Wilbraham, MA and currently resides in Westfield, MA. 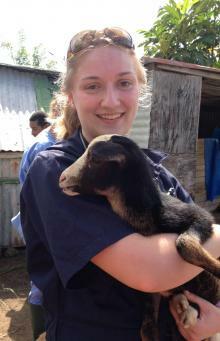 She previously worked in a mixed animal practice caring for both small and large animals. She currently is a member of the American Veterinary Medical Association and the American Association of Equine Practitioners. In her freetime, Dr. Lajzer enjoys riding and spending time with her horse Acaprise as well as spending time with her cat Joe and her blind rescue dog Stevie Ray. She also enjoys traveling, music, the beach, and spending time with her family. Amanda Lowe joined the team at Westfield Animal Clinic in December of 2018 taking on the role of Office Manager. Amanda has 9 years of experience in investments, financial analysis, and book keeping. She also works in Emergency Medical Services as an EMT. In her free time Amanda shares her love and passion for animals volunteering her time and doing therapy work with her English Mastiff Mac at various events. They regularly visit the veterans at the Holyoke Soldiers Home, spend time with children through events such as Reading with Rover, and work with the active military through events such as Air National Guard Yellow Ribbon Event. In her free time Amanda enjoys showing Mac in local competitions at the Eastern States Fair Grounds as well as nationally at Westminster. On October 21, 2018 Mac received his Grand Champion Bronze certificate and at the end of 2018 was ranked 12th amongst Mastiffs. Amanda also enjoys spending time with her husband Chris and their two kids Alliyah and Cody, their 2 other dogs Shea and Ka, and their chinchilla Bolt. Amanda brings her experience and knowledge of raw diet and nutrition as an asset to Westfield Animal Clinic's clients and patients. She also hopes to help introduce laser therapy as another great service offered at Westfield Animal Clinic in the near future. 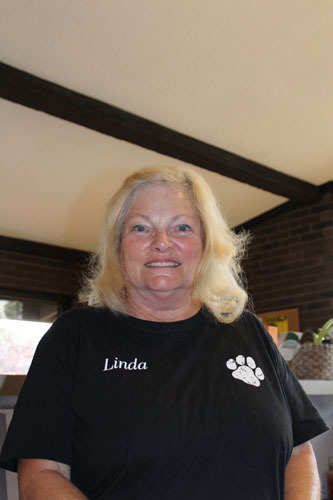 Linda Edmunds is a receptionist at Westfield Animal Clinic. She has been with the clinic since 2008. Linda enjoys spending time with her dog Sophie, her husband Bernie, and their grandchildren. They enjoy traveling and spending time outdoors. 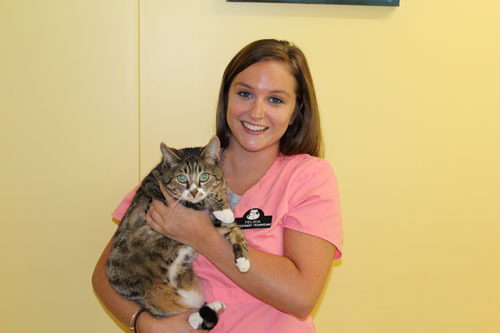 Felicia Murphy has been working at Westfield Animal Clinic as a veterinary technician since 2011. In her free time Felicia enjoys spending time with her dog Rylie, an American Bulldog, and her cat Bella, a Bengal. 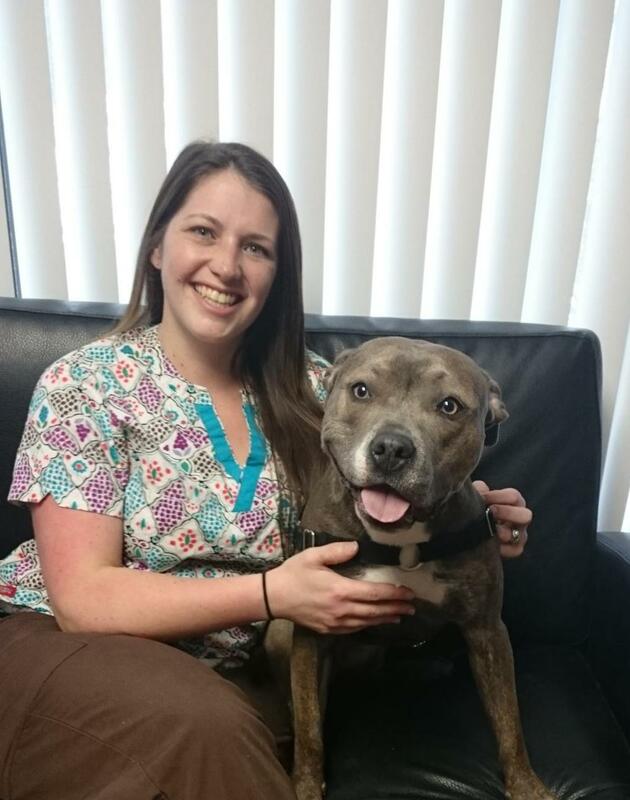 Molly Jacobs is a certified veterinary technician who has been with Westfield Animal Clinic since October 2015. She graduated with honors and received her associates in Animal Science from Holyoke Community College. She has been working in the veterinary field since 2008. In 2019, Molly was promoted to Lead Technician as she exemplifies the qualities of a leader - hard working, reliable, dedicated, continued pursuit of furthering her education, compassion, and love for animals. At home, Molly has 3 cats Kush, Pink, and Jax and 2 dogs Murdock and Maybelle. Away from the clinic, Molly spends time with her husband Taylor and their 2 daughters Hailey and Mackenzie. Cindy Tourville joined the Westfield Animal Clinic in August 2018 as a receptionist with having many years of experience working as a receptionist in the veterinary field. Danielle Wheeler joined the team at Westfield Animal Clinic in August 2018 as a veterinary technician.